Donegal Railway Restoration CLG > Blog > Museum News > Bon Voyage! 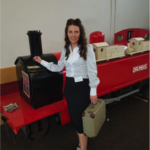 It has been a very exciting time working with County Donegal Railway Restoration. I have had the opportunity to build relationships with some really great people who are dedicated to conserving and protecting our heritage whilst also developing and improving the rail related tourism project in Donegal through collaboration,innovation and really, really hard work. I would like to thank each of the board members for their support over the last seven months, the staff that worked really hard to adapt to the changes since my arrival and all the individuals, stakeholders and members that have helped us to have the best Summer ever. But this is just the start. With the right people, support and vision I believe Donegal can have an amazing railway tourism product that can achieve positive social, economic, cultural and heritage outputs. Its time for me to move on now to a new chapter in my life but I have every confidence in the people of Donegal getting behind this project to make it what it can be. I wish the board and everyone that supports this exciting project all the very best for the future and no doubt we will keep in touch. Your ticket for the: Bon Voyage!